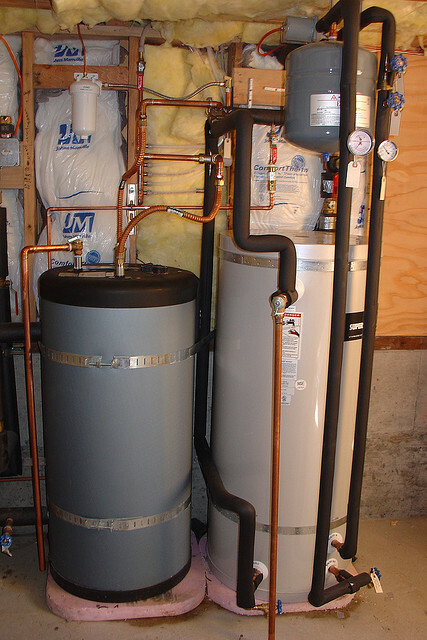 A great way to ensure that your home is using both energy and water efficiently is to ensure that your hot water tank is running like it should. Over time things like lime, calcium and other minerals can build up in the base of your hot water tank, and this will cause your hot water tank to work harder to heat the water for your home. A great way to get rid of that mineral build up is to flush your hot water tank, but if that isn’t enough you can add vinegar to your hot water tank, which will help to break up the deposits so they’ll drain more easily. The same cleaning techniques can also be applied to patio heaters. Before proceeding with this project, if you are at all unsure or weary of performing maintenance tasks on your hot water tank, stop. Call up a local technician and have them maintain your hot water tank for you. 1. Turn off the power to your hot water tank. Simply open up your homes circuit break and flip the switch that controls the power to your hot water tank (which should be labeled) to the off position. 2. Open up a faucet in your home. Turn on the hot water in one of the faucets in your home. This will prevent a vacuum from forming within your system and allow it to drain properly. Be sure to leave the faucet on while performing the first part of this project. To minimize water waste, you can just turn it on low….just enough so that water’s moving through the system. 3. Attach a hose to the drain valve on your hot water tank. Screw the hose into place at the base of your hot water tank and be sure to run the other end to either a drain outside the home or bucket. 4. Turn off the cold water for the hot water tank. The cold water line that runs into your hot water tank should be located just above your unit. Simply take the lever and turn it to the off position. 5. Drain some of the water from your hot water tank. Now that you’ve turned off the power, opened up a faucet, attached a hose and turned off the cold water line to the tank you’re ready to partially drain the tank. Simply open up the drain valve located at the bottom of the tank and allow it to start draining. If you’re emptying the water into a bucket you’ll have to dump the bucket at least 3-4 times in order to drain a sufficient amount of water. Just be sure that you don’t leave the drain valve open while you’re emptying the bucket. Once you’ve drained some of the water from your tank, you can turn off the faucet in your home. 6. Locate the anode rod on your hot water tank. Now it’s time to remove the anode rod. Curious what an anode rod is? It’s basically a sacrificial piece of metal that’s put into your hot water tank that helps to prevent the build up of rust along the interior of the tank. The rod is located on the top of the tank and is recessed into the lid of the unit. 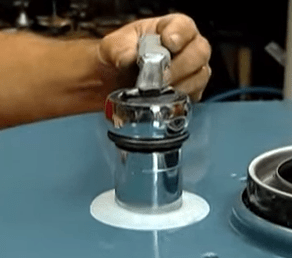 In some cases, the hot water tank will have a lid that covers that anode rod, you’ll need to remove this lid (usually held in place by screws) in order to gain access to the anode rod. Look for the hexagon shaped bolt on the top of the hot water tank. 7. Remove the anode rod from your hot water tank. Now that you’ve located your unit’s anode rod, take your socket wrench and loosen it till you’re able to pull it free from the hot water tank. Be careful as you remove the anode rode, while it isn’t delicate per-say, it could be falling apart or eroding in places. You’ll need a 1 and 1/16th Inch socket in order to remove the anode rod. 1 & 1/16th” is the industry standard for this part. 8. Pour in the vinegar. Now that you have access to the inside of the tank it’s time to add the vinegar. Take your funnel and place it into the opening for the anode rod, now pour your vinegar into the belly of the hot water tank. Once you’ve added all of the vinegar all you have to do is remove the funnel and set it to the side. 9. Put the anode rod back in place (or replace with a new one if necessary). Simply take your anode rod and put it back into the hot water tank and snug it up using your socket wrench. It’s also a good idea to put a thin layer of teflon tape around the grooves on the head of the anode rod. This will help to ensure a snug, air tight fit. Note the teflon tape that is covering the grooves on the end of the anode rod. 10. Add water to the hot water tank. Now that you have the vinegar inside the hot water tank and the anode rod in place it’s time to add some water back to the tank. Turn on the cold water supply and let it run for roughly 5-10 minutes. Running the water for 5-10 minutes won’t fill the tank, but it will help to stir up the vinegar and circulate it around the inside of the hot water tank. 11. Let the water/vinegar solution sit for at least 6 hours. The water/vinegar solution will need time to break down and loosen the deposits that have been caked onto the inside of the hot water tank, so let it sit for at least 6 hours. As a side note, be sure to let everyone in your home know (before starting this project) that your water tank will be out of commission for a day. 12. Drain the water/vinegar solution from the tank. Now that you’ve let the water/vinegar solution sit for at least 6 hours it’s time to drain the tank. Turn on a faucet somewhere in the home and open the drain valve at the base of the tank. Remember, you’ll want to have a hose attached to the drain valve with the other end emptying into a drain or bucket. It’s important to note that when your draining the tank large chunks of sediment could clog the hose. If this happens, simply use your hands to massage the line till you feel the obstruction start moving through the hose. Once you’ve finished draining the tank you’re ready to refill it. 13. Refill the tank with water. Be sure that the drain valve is closed and your taps are turned off before proceeding to fill your hot water tank. Once it is, all you have to do is simply turn on the cold water supply and let the tank do it’s job. 14. Turn the power to your hot water tank back on. Now all that’s left is to turn the power to the hot water tank back on. Head over to your home’s breaker box and flip the switch back to the on position. No sweat, right? Again if you are at all unsure or hesitant to perform this task don’t do it. Contact a local professional and have them service the tank for you. If you’re looking for more ways to make your home more energy efficient, be sure to check out our green home improvement projects: Green Living Ideas, after all, is a top 20 home improvement website! More ways to use vinegar to clean your home!